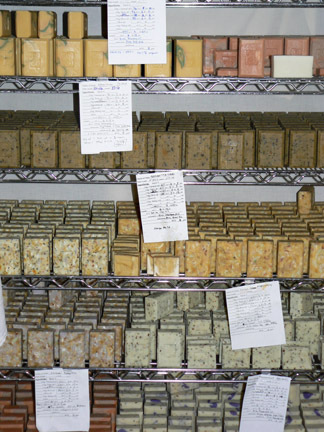 These cold processed soaps are made from selected ingredients not a purchased melt and pour base. The soap formulas for these Luxury Soaps do vary slightly with the different soaps, but on average the breakdown of saponified oils and ingredients are 28% Organic Extra Virgin Olive Oil sourced from Tunisa, 25% Organic Coconut Oil produced in the islands of the Philippines, 25% Organic Palm Oil produced in Brazil, 13.5% Organic non-GMO Soy Oil product of USA, 6.2% Pure Steamed Essential Oils, 1.3% or less teas, botancials, herbs, clays, and mineral colorants, 1% Rosemary Oleoresin Extract. Luxury soaps are defined by having equal qualities that are moisturizing, sudzing and are a harder longer lasting bar. The saponified oils are blended with organic herbs, seeds and oats, Green tea, wheatgrass powder, silk peptides - my only non vegan ingredient, lavender flowers, lemon peel, cocoa powder, clays and minerals and whatever else is good for our skin and looks like it might be fun. Some soaps are unscented, but the others have only pure steamed extracted essential oils from herbs, spices and flowers. No synthetic fragrances are used. These Cold Processed soaps retain the natural glycerin. There are no artificial additives or toxic preservatives. The soaps contain Rosemary Oleoresin Extract as a protective anti-bacterial and anti-microbial. The colorants are from natural mineral and plant sources. Some colors are the herbs themselves or from mined clays while others are the refined iron oxides that have mineral impurities removed. Regardless, all ingredients in the soaps are listed on the labels. 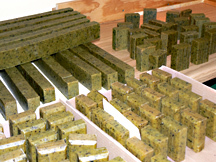 Once the soaps are cut and stamped, they're stacked on the drying rack to cure at least a month or longer.